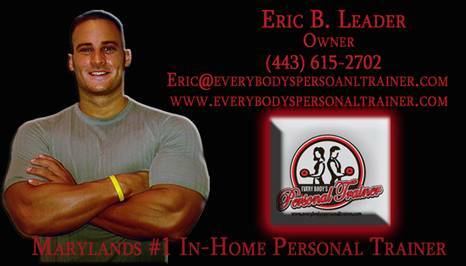 -Every Body's Personal Trainer owner, Eric Leader, has been selected by Fox 45 in Baltimore, to take part in a beauty make over segment to be aired on the station. In addition to various other businesses in Baltimore, including dentistry, plastic surgery, skin care, etc. Eric has been selected to represent the fitness end of the make over show. -Owner/Personal Trainer Eric Leader has been booked by Knowlera Media to shoot an exercise video. We look forward to including the video link in the near future. -Owner Eric Leader, and the Every Body's Personal Trainer Team, have been selected to take part in People Magazine's weight loss challenge. We'll keep you updated. -Owner Eric Leader has been interviewed, and recently appeared, in an article by the Baltimore Examiner. -Owner Eric Leader has been declared as an expert author by ezinearticles.com.